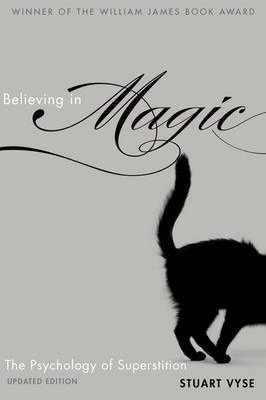 Over the past month, I have been reading the book Believing in Magic, by Stuart Vyse. The book is very interesting to say the least, and touches on some extremely interesting topics, specifically related to the paranormal. Al thought our society is technologically advancing every day, the phenomena of superstition is forever growing more and more widespread. The awesome thing about superstitions is that it's not bias as to who you are, what you are, your lifestyle and so on. According to Vyse, superstitions are the brains natural result of very well-understood psychological processes; including coincidence and our need to have as much control as we humanly can. Vyse's main point throughout this book, is that although superstitions are a part of our culture, we should learn to start using other types of methods to cope with the uncertainly of life by having better decision analysis, learning more about science education, and teach ourselves to better evaluate the root of our beliefs. My favorite section of the book was chapter 6, is superstition abnormal, irrational, or neither? Basically what this chapter is about is whether or not superstition is "normal", or could even be part of a psychological disorder. The author talks about people with obsessive compulsive disorder and how they have irrational fears of germs and have to do rituals to feel satisfied. he continues to talk about people with psychosis and schizophrenia and how they view the world and their beliefs. It really makes you think if superstition is normal to all of us, or just some of us; or if we all have some type of psychological issue. This chapter can easily relate to this course because pseudoscience is a science just like psychology is. This course evaluates the way our brain works and why we believe certain things and why certain things can happen to us; such as out of body experiences, or future telling. it all intertwines with how our own brain works. This class as well as this book have helped me view the world and my beliefs a little differently now. Instead of "jumping the gun" so to speak, I evaluate my own beliefs and superstitions with a little bit more of a scientific approach. For example, if I see a weird flash of light, or hear a strange noise at night, I run through all the possibilities it could be instead of assuming it's something paranormal. Everybody should take a more scientific approach to life, and rationalizing the irrational.